BY TOM TENNEY | In a 1913 letter to the composer Francesco Balilla Pratella, Italian Futurist Luigi Russolo declared, “The variety of noises is infinite…today we have perhaps a thousand different machines, and can distinguish a thousand different noises, tomorrow, as new machines multiply, we will be able to distinguish ten, twenty, or thirty thousand different noises, not merely in a simply imitative way, but to combine them according to our imagination.” This letter, which became a known as “The Art of Noises,” advocated a new sonic vocabulary through the imitation of machines and became one of the most important manifestos in the history of sound. As technological advances at the turn of the century paved the way for a revolution in mass media, they also created new possibilities for individual expression. By mid-century, the computer had opened new sonic territory by permitting unprecedented extension of sounds and scales, pushing the boundaries of music beyond what the Futurists ever imagined. In 1983, seventy years after Russolo’s letter, a British avant-garde electronic group that called itself The Art of Noise (after the manifesto) released a song that mixed sampled sounds of car engines and industrial machinery with time-warped drum beats and orchestral stabs. This song would become one of the most influential instrumentals in the world of hip-hop, sampled by artists from X-Clan to Marky Mark. The name of that song was “Beat Box.” A year later, an 18-year-old rapper from Harlem by the name of Doug E. Fresh pioneered the art of imitating electronic drum machines using only his voice — the art of “beatboxing” was born, and the verity of Russolo’s vision was, once again, affirmed. As do all musical genres, beatboxing has evolved in the intervening three decades, spawning a variety of techniques, including the “human turntable,” a style invented by Wise of the group Stetsasonic, and “mouth drumming” developed by Wes Carroll. 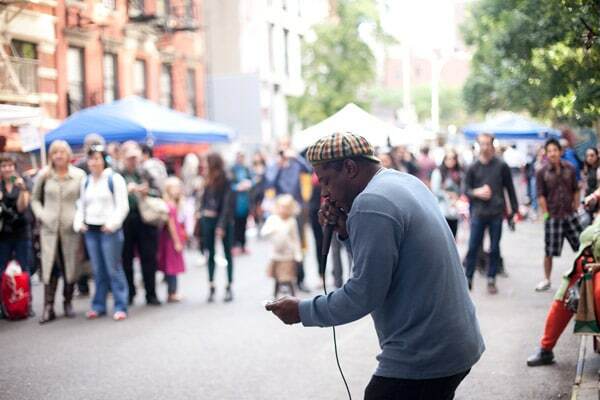 From May 24-26, the Third Annual American Human Beatbox Festival at LaMaMa Theatre will give New Yorkers the opportunity to sample some of the most eclectic beatboxing styles by artists who make percussive rhythms with the human voice. For the most part, however, Lucky has seen beatboxers use beatrhyming mainly as a musical machination, a trick for cheap applause. Lucky, who began beatrhyming in the mid 90’s, saw the potential to elevate the style into an art form in its own right. “People used beatrhyming as a trick, or a gimmick,” he says, “I saw it as something much more than that. I saw the possibilities to take the concept and push it beyond the boundaries of what anybody else is doing. That’s how you move from gimmick to art.” He’s also quick to point out that beatrhyming doesn’t necessarily mean rapping, but can include a number of vocal styles including singing and spoken word. Those who wish to experience this “pushing forward” in person should check out the beatrhyming battle on May 24th, where the performers will include: D-Cross, Kid Lucky, Kaila, Graffiti, Richard, Esalaah, Kenny Urban, Mandibul, Menyu, and Baba Israel. Saturday morning, bring your baby beatboxers to the Kids Beatbox Workshop, and then come back for the emcee/beatboxer team battles at 10. Sunday’s offerings include Nos States, a documentary about French boxer, Priceps, followed by a tribute to the late Steve Ben Israel. It’ll be a unique celebration of music, beats, words, and the art of human noise.